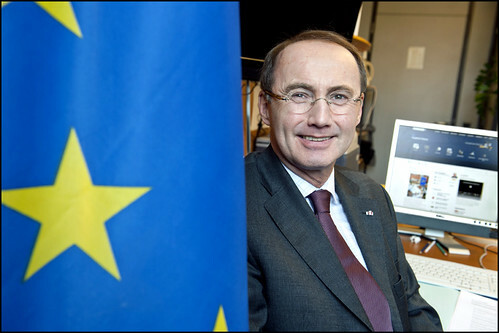 Othmar Karas (Vice President of the European Parliament) represented the European Parliament at the G20 Speakers Consultation in Riyadh, Saudi Arabia between the 24th and 26th of February. European Ideas has exclusively been given the draft of his speech, in which he explains the EU's response to the current crisis and argues that we need to reinforce global cooperation. You all know that the European Union is going through a difficult phase. But we are also strong enough to overcome the current economic crisis. We can't yet say that we have put all our problems behind us, but we can say that we can now see the light at the end of the tunnel. What are the causes of our own crisis? Well, first, we have to acknowledge we created an incomplete monetary union. While we established strong policies, we also left loopholes. And these loopholes made it possible for Member States to apply very different financial and economic policies — some that were inappropriate and that triggered our current crisis. We accept our share of responsibility for this. The EU and most of our MS failed to create a genuine economic and monetary union. Instead, we privileged a national approach to growth. And now we are facing the proof that this was far from the right approach to adopt. That said, we are not the only ones responsible. The economic crisis has its roots in excessive deregulation and the unsustainable credit policies that were adopted in the United States. And in this respect, the EU has also fallen victim to the poor choices of other policy makers. But at this point we must focus on the solution rather than the cause. And we know that at the end of this process, a stronger and more coherent European Union will emerge. We have no alternative to deepening our union. Europe needs to speak with one voice. We need to think with one voice as well. This implies some significant choices for us within the EU. The intergovernmental method that we once adopted now seems a relic of the past. We have entered a phase of stronger unification. In the European Parliament, my own home within the EU, we have set up a special committee on the financial, economic and social crisis. I had the honour of leading the committee. And though it was hard work, we were able to draw up a report that I am proud of, and that I think addresses the fundamental questions of this crisis. We made a case for a new monetary system, for Eurobonds, for new forms of global governance. We considered the needs of our SMEs as well as our corporations, the private sector as well as the public. It does not make sense for me to enter into all the details of our report here. But I can sum up for you what it means: we need stronger economic and financial governance. We have some specific ideas on how to accomplish this. We have adopted a package of six legislative proposals on economic governance. These will increase the transparency and the accountability of the decision-making in Europe, and they will improve our national fiscal framework. We have also created a new treaty, called the 'fiscal compact'. This will take the form of an international agreement between our Member States and will be signed in March 2012. The aim is to strengthen fiscal discipline by introducing more automatic sanctions and stricter surveillance. We will adopt a new 'balanced budget rule'. The European Parliament has been actively advocating these changes. We have also criticised the way this new treaty has been concluded, because once again the process was an intergovernmental one. But, friends and colleagues, we also understand that our comments and actions to date are not enough. The European Union is learning that fiscal rigour cannot be our one and only goal. Austerity alone is not the answer. We must couple financial responsibility with economic growth. And to create that growth, we also need sound politics. This point was clearly made by our President of the European Parliament, Martin Schulz, when he spoke to the last European Council of head of states and government. Growth and jobs were also the focus of our Europe 2020 strategy. This strategy has led to new policies in most of our Member States. The policies were not imposed. When they were adopted by our States it was because the states clearly believed the plans represented the best exit path, out of our crisis. But if growth — accompanied by responsible fiscal policies — is the grail, how do we in Europe achieve it? To begin, we need to restore some of our competitiveness. Over the last years, we have seen emerging markets take over some of the work that we once did. I'm not suggesting that the EU should begin producing goods we stopped manufacturing a long time ago. But I am suggesting that we re-evaluate the bases of our economies, and that we don't shy away from deep reforms and new relations with third markets. We need innovation and green technologies. This is how we can create growth and jobs. And how we will support our welfare system. To recover from the crisis, we must improve our trade. But accomplishing this, as you all know, is far from simple. Despite the work of the WTO, there are still many barriers that restrict our access to the most dynamic and performing markets. These are barriers we need to remove. Doing so would shorten our recovery period. It would also offer advantages to our partners: a larger public would have access to the upmarket and brand products that represent the EU's 'comparative advantage'. At this point I want to turn to the second part of my reflexion. The world has changed. But the Bretton Woods system has, unfortunately, not. I am not saying that the IMF and the WB should be closed. They have played a pivotal role in these recent, difficult years. But it is time to review these organisations. Emerging economies are demanding greater representation, and it is time we listened to them. When it came time to select a new head of the International Monetary Fund, for example, we heard the voices of national interests. Traditionally, the position was filled by a European — more or less in exchange for the World Bank, which is headed by someone from the US. But is this a valid tradition? As the President of the European Council, Herman von Rompuy, said, it also used to be a tradition to have an Italian pope. It's time to re-evaluate. We need to sit down and discuss the possibilities. Our choices should be based on a thorough assessment of all the candidates, not just our own. This doesn't mean giving new power to emerging countries. It means acknowledging the power they have. In turn, new emerging economies will have to realize that their new honors will come with new burdens. The two go hand-in-hand. Refusing to resolve global imbalances will prove a dangerous choice, because it assumes that the crisis cannot any further than it has. And that assumption is simply incorrect. Only cooperation on a global scale and real economic governance will prevent further economic recessions and their potentially disastrous effects. It is not only the well-being of developed countries that is at stake. The risks are also real for poorer populations — in developing and in industrialised countries. We have to reflect together on further steps of reform. Should we integrate the Bretton Woods institutions into the UN? Has the time come to establish of a World Economic Council? Personally, I am in favour of this. Let us have a real debate! That brings me to what I consider the most important aspect of all this: the involvement of parliaments in the global governance debate.The G20 is dominated by governments. But bringing parliaments into the mix can add something — a new dimension. Let's be frank: governments can be selfish and short sighted. And although they have power, they're not always able to recognise new solutions. Sometimes parliaments can bring a new perspective. Let me give a negative example. We have all failed to find an agreement on the Doha development round. Everybody knows how important is free trade and liberalisation are to secure better market conditions and support economic growth, and we've made huge efforts. But we're still far from reaching a deal. Maybe it's time for parliaments to have a try. After all, once we do have an agreement, it will be our job to implement it. Today is the third time that we speakers have met. We can be proud of our achievements. But now it's time to raise the stakes. We can develop our cooperation — not only at the speakers' level, but also at the level of our committee work and our legislation. I would like also to make a concrete suggestion. Our joint communiqué deserves attention and follow up. I propose that at the next G20 Summit in Los Cabos one of us presents our communiqué . The link between our activities here and those of our governments at home would be clear. Again, I would like to thank our hosts for this meeting and for giving us the opportunity to exchange views.